Publisher: Orion ISBN 13: 9780752857022. Author: Ridley Pearson ISBN 10: 0752857029. Title: The Body of David Hayes Item Condition: used item in a very good condition. Books will be free of page markings. In Very Good (VG) Condition. Shows some small signs of wear - but no tears - on either binding or paper. Worn but untorn. No defects to the book, jacket or pages. Sun Valley sheriff Walt Fleming's budding relationship with photographer Fiona Kenshaw hits a rough patch after Fiona is involved in a heroic river rescue. Then Walt gets a phone call that changes everything: Lou Boldt, a police sergeant from Seattle, calls to report that a recent murder may have a Sun Valley connection. Walt knows there's a link-but can he pull the pieces together in time? 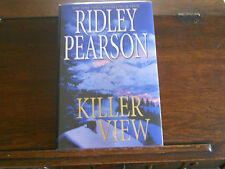 KILLER VIEW by Ridley Pearson, signed, 1st edition/1st printing July 2008 G.P. Putnam's Sons. This book is in near fine condition with anear fine dust jacket. Spine-ends and corners straight. Price intact, not remainder marked. Years ago, Lou Boldt's wife Liz had an affair with David Hayes, a young computer specialist at the bank where she is an executive. Liz is torn between wanting to protect the bank and needing to protect her family. Published by G. P. Putnam's Sons, New York, 2009. First Edition. 367 page novel. Tight and clean interior. Bottom corners lightly bumped. Edges of text block a little darkened. Jacket has light edge wear with small wrinkles at spine ends & along top edge. Publisher: ORION ISBN 13: 9780752856902. Title: THE ART OF DECEPTION Item Condition: used item in a very good condition. Books will be free of page markings. Will be clean, not soiled or stained. This is for a lot of 8 Ridley Pearson Mysteries. All book Titles and Authors are listed below. The Pictures are the books you will receive in this box. No Witnesses. Parallel Lies. The First Victim. Ridley Pearson's Mystery Thriller "In Harm's Way", was published as hardcover with dust jacket by Putnam c2010 (978-0-399-15654-0). Book is a 1st Edition, 1st Printing, in Like New condition: no obvious faults or issues. Ridley Pearson. He is also keeping his eye on the Fire Warden, who seems to be a little too close to the heat. Beyond Recognition. Random House and it's subsidiaries use a line starting in "2 " (recently they started using a "1 " like other publishers) and state plainly"First Edition" if it is a first printing and eliminate the"First Edition" once they start the second printing. Ridley Pearson's Mystery thriller "Parallel Lies" was published as hardcover with dust jacket by Hyperion c2001 (0-7868-6564-4). Book is a stated 1st Edition, 1st Printing, in Like New condition: no obvious faults or issues. Published by G.P. Putnam’s Sons: New York, 2009. 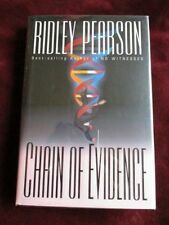 Ridley Pearson's Mystery thriller "Chain of Evidence" was published as hardcover with dust jacket by Hyperion c1995 (0-7868-6172-X). The image is of the book that you will receive. This is not a condition issue. Book is a 1st edition, 1st printing in Like New condition: no obvious faults or issues. Images are of the book you'll receive. This is not a condition issue. THIS RIDLEY PEARSON EDITION IS IN VERY GOOD CONDITION. What is Very Good condition?. A book in Very Good condition is a typical used book. 99% OF OUR BOOKS ARE PREVIOUSLY READ AND ARE NOT NEW. What is Acceptable condition?. A Walt Fleming mystery/thriller! Signed by the author the title page! Putnam 1st edition, 2009, with complete number line. Not price-clipped, no remainder marks. Ridley Pearson's Mystery Thriller "The Pied Piper" was published as hardcover with dust jacket by Hyperion c1998 (0-7868-6300-5). Book is a stated 1st edition, 1st print in Like New condition: moderate chipping at bottom edge of jacket, no other obvious faults or issues. A Walt Fleming mystery/thriller! Signed by the author the title page! Putnam 1st edition, 2007, with complete number line. Not price-clipped, no remainder marks. Ridley Pearson's Mystery Thriller "Middle of Nowhere" was published as hardcover with dust jacket by Hyperion c2000 (0-7868-6563-6). One book is a stated 1st edition, 1st printing in Like New condition: no obvious faults or issues. Condition: Like New-listened to once Unabridged audiobook on 10 CDs. S/H fee: US-FREE. Author: Ridley Pearson ISBN 10: 067185187X. Title: Angel Maker Item Condition: used item in a very good condition. Ridley Pearson's Mystery Thriller "The Body of David Hayes" was published as hardcover with dust jacket by Hyperion c2004 (0-7868-6725-6). Book is an author signed stated 1st edition, 1st printing in Like New condition: no obvious faults or issues. Ridley Pearson's Mystery Thriller "The Art of Deception" was published as hardcover with dust jacket by Hyperion c2002 (0-7868-6724-8). Book is a stated 1st Edition, 1st Printing, in Like New condition: no obvious faults or issues. Author: Ridley Pearson ISBN 10: 0356206017. Title: HARD FALL. Item Condition: used item in a very good condition. Will be clean, not soiled or stained. Books will be free of page markings. Published by G.P. Putnam’s Sons: New York. A Daphne Matthews/Lou Boldt mystery/thriller! Signed by the author the title page! Hyperion 1st edition, 1994, with complete number line. Book and dust jacket are in Fine Condition. Not price-clipped, no remainder marks. Publisher: ORION ISBN 13: 9780752857220. Title: The Pied Piper Item Condition: used item in a very good condition. Author: RIDLEY PEARSON ISBN 10: 0752857223. Will be clean, not soiled or stained. A Daphne Matthews mystery/thriller! Signed, inscribed, and dated by the author the title page! Hyperion 1st edition, 2002, with complete number line. Not price-clipped, no remainder marks. A Walt Fleming mystery/thriller! Signed by the author the title page! Putnam 1st edition, 2010, with complete number line. Not price-clipped, no remainder marks. A Grace Chu/John Knox mystery/thriller! Signed by the author the title page! Putnam 1st edition, 2012, with complete number line. Not price-clipped, no remainder marks. Ridley Pearson. Binding:Straight intact. Random House and it's subsidiaries use a line starting in "2 " (recently they started using a "1 " like other publishers) and state plainly"First Edition" if it is a first printing and eliminate the"First Edition" once they start the second printing. Publisher: Pocket Books ISBN 13: 9780671855017. Author: Ridley Pearson ISBN 10: 0671855018. Title: Chain Of Evidence Item Condition: used item in a very good condition. Book Details. Books will be free of page markings. Signed by the author the title page! Hyperion 1st edition, 2005, with complete number line. Book and dust jacket are in Fine Condition. Not price-clipped, no remainder marks. Author: Ridley Pearson ISBN 10: 0752846019. Title: Parallel Lies Item Condition: used item in a very good condition. Will be clean, not soiled or stained. Published On: 2001-01-01 SKU: 7719-9780752846019. Ridley Pearson's Mystery thriller "The First Victim" was published as hardcover with dust jacket by Hyperion c1999 (0-7868-6440-0). The image is of the book that you will receive. This is not a condition issue. A Peter Tyler mystery/thriller! Signed, inscribed, and dated by the author the title page! Hyperion 1st edition, 2001, with complete number line. Book and dust jacket are in Fine Condition. Not price-clipped, no remainder marks. Signed by the author the title page! Book is in Fine Condition. Dust jacket has minor edgewear, sunning, otherwise in Fine Condition. Not price-clipped, no remainder marks. Signed by the author the title page! Hyperion 1st edition, 1990, with complete number line. Book is in Fine Condition. Dust jacket has 1/16" split to bottom spine, otherwise in Fine Condition. Not price-clipped, no remainder marks. The Downward Spiral: Lock And Key by Ridley Pearson (PB, 2017) Advanced Reader's Copy, Rare, 1st. Condition Details - The book is inexcellent, as-new condition ; it has a square spine, a tight binding, and no marks, tears or writing. The cover has no edgewear, soil or stains. A peel-off promotional sticker is affixed to the front panel. The Seizing of Yankee Green Mall. Ridley Pearson. Random House and it's subsidiaries use a line starting in "2 " (recently they started using a "1 " like other publishers) and state plainly"First Edition" if it is a first printing and eliminate the"First Edition" once they start the second printing.